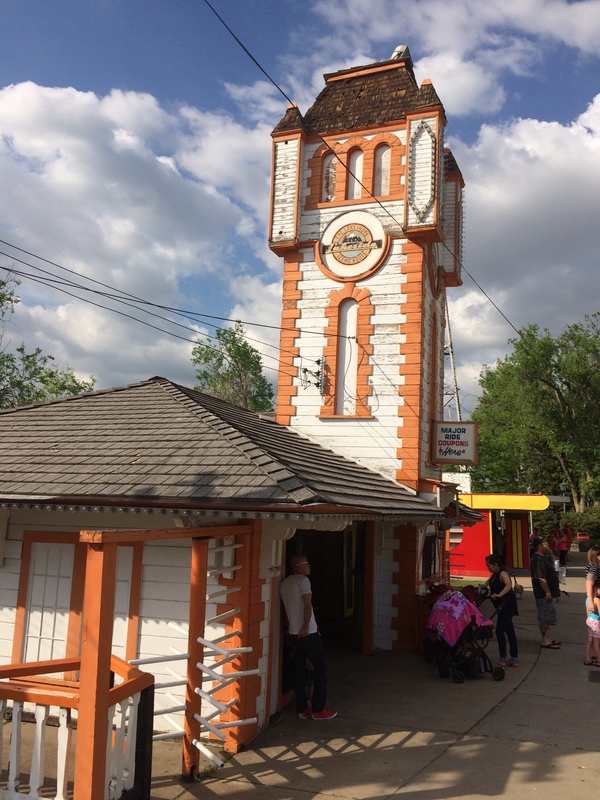 I really had a good time here despite its aged look and I think you will too if you enjoy history and riding rides that aren’t normally found at the big amusement and theme parks. Adolph Zang, owner of Zang Brewery, was looking for a place where people could visit, socialize, stroll through beautiful gardens, enjoy music and dancing, and drink his beer. He finally settled on this piece of property that originally surrounded Lake Rhoda, founded the city of Lakeside so he could set his own laws, specifically pertaining to the sale of alcohol, and opened his own park in 1908 called White City. The town of Lakeside still exists with a population of 8 as of the 2014 census and it has its own police department as well called the Lakeside Police Dept. The eight people who live in Lakeside are mostly employees of the park itself. The park only ran under the White City for a season or two before changing its name to Lakeside, it should also be noted that this was considered a Trolley Park, not because a trolley company owned it as in the case of Kennywood Park near Pittsburg, Pennsylvania, but because this park was serviced by a street trolley that ran down Sheridan Blvd. which had a stop near the park gates. The two oldest structures (pictured above) in the park are all that is left of the White City era and they are the tower and the ballroom. 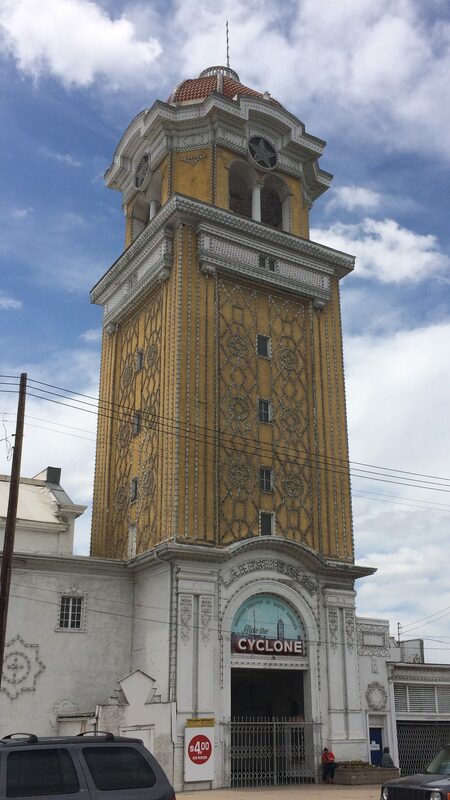 The tower is 150 feet tall, was designed by Edwin H Mooreman, and is called the Tower of Jewels because of the thousands of lights that adorn its façade. 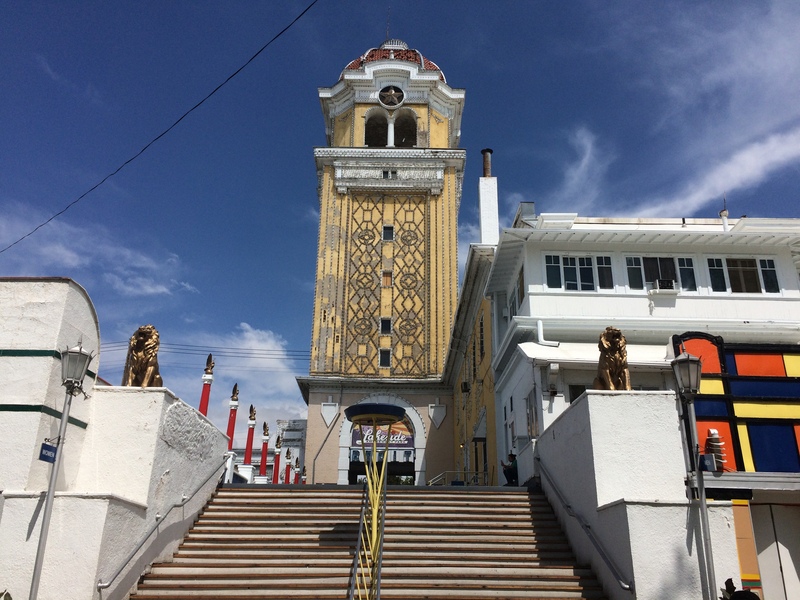 The tower also served as the main gate and had an observation deck at the top. The ballroom was called the El Patio Ballroom where you could dance the night away with music from the popular bands of the era. Below the El Patio was a huge rathskeller that ran under a number of different names, the last of which is the College Inn. Here is where you could buy your liquor and alcohol. Both now sit idle and are used as storage and office space for the park. 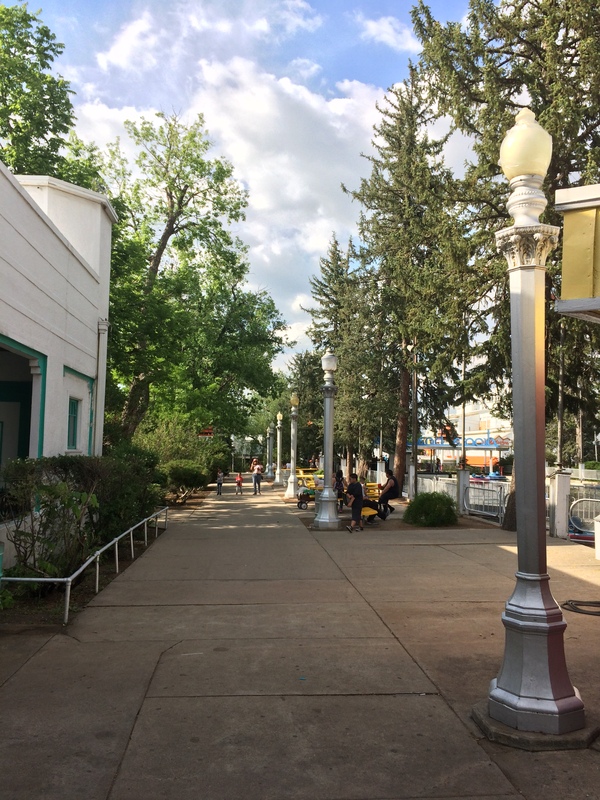 Unfortunately, the park went through some hard times as many parks did and one of those happened during the Temperance movement when the sale of alcohol was banned at a national level. Zang Brewery, from what I’ve heard was a better tasting alcohol than nearby Coors, chose to go into the ice cream business like Anheuser Busch did and Coors chose to go into the ceramics business to survive. The ice cream business may have been good for AB but it wasn’t good for Zang and they were forced to close up and sell their assets, including the park. Coors, on the other hand, survived and they still have and operate their ceramics division. 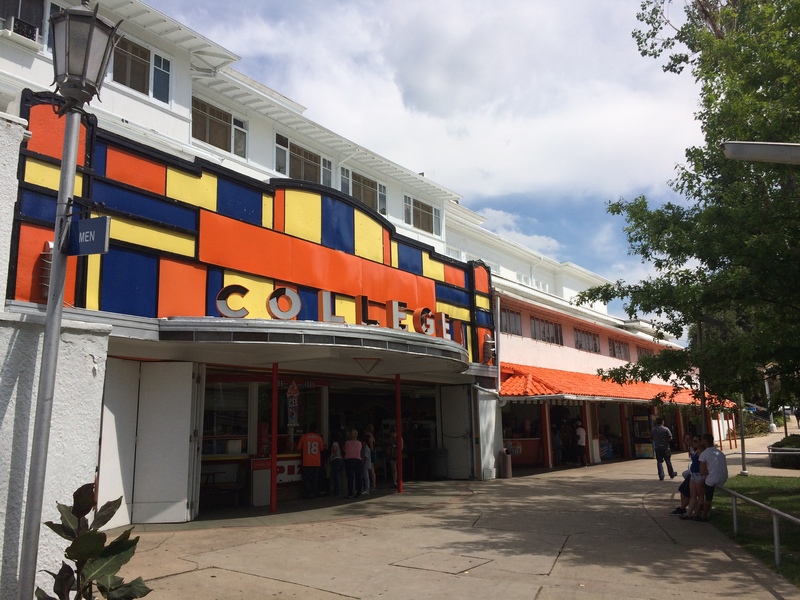 A person by the name of Benjamin Krasner bought the park in the 1930’s and he hired Architect Richard L Crowther to renovate the park and give it the current Art Deco look it has today complete with lots of neon lighting. The Krasner family still owns the park to this very day. 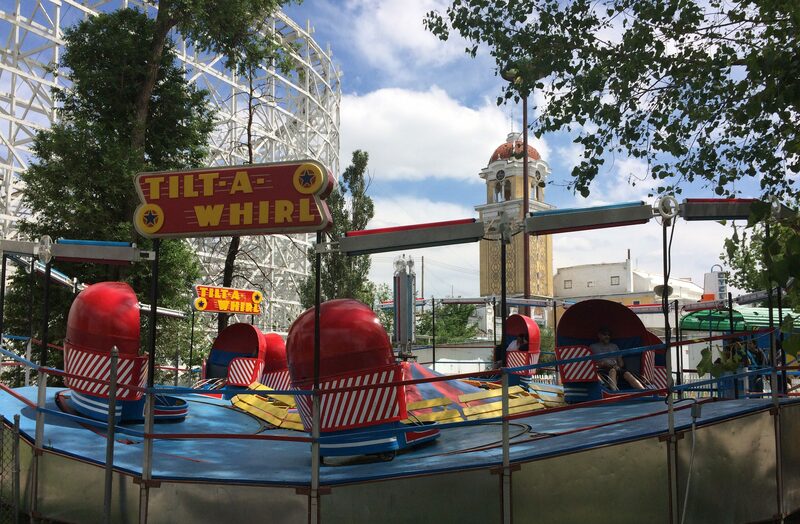 One of the parks earliest rides was a thrilling, for the time, boat ride called Shoot the Chutes where riders would board a boat, be pulled up to the top, turn around and slide down a long ramp into the lagoon below. This Mutoscope video from the Library of Congress’s YouTube video shows the one that was at Luna Park in Coney Island, New York so I’m pretty sure Lakeside’s version was pretty similar. 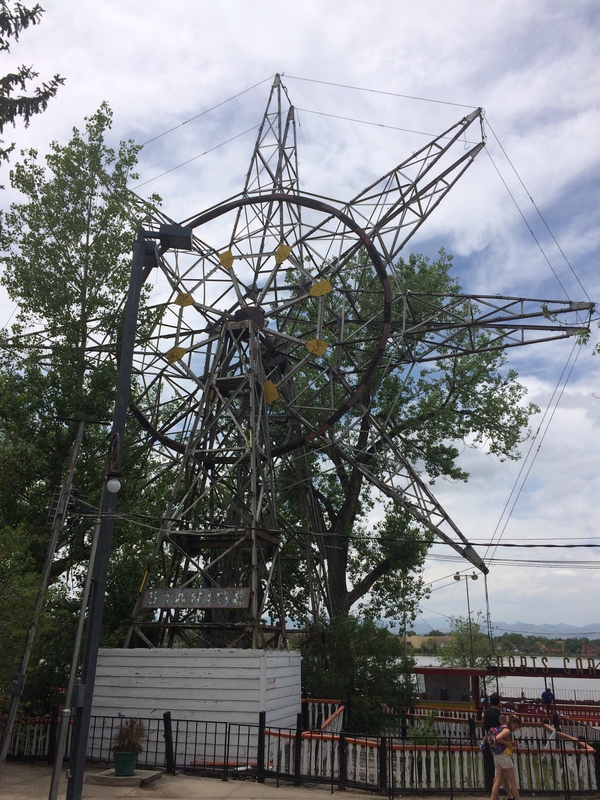 There are several rides that are standing but not operating at the park such as this Starride which was the parks first Ferris Wheel. Then there was the circle swing that operated here for a while. 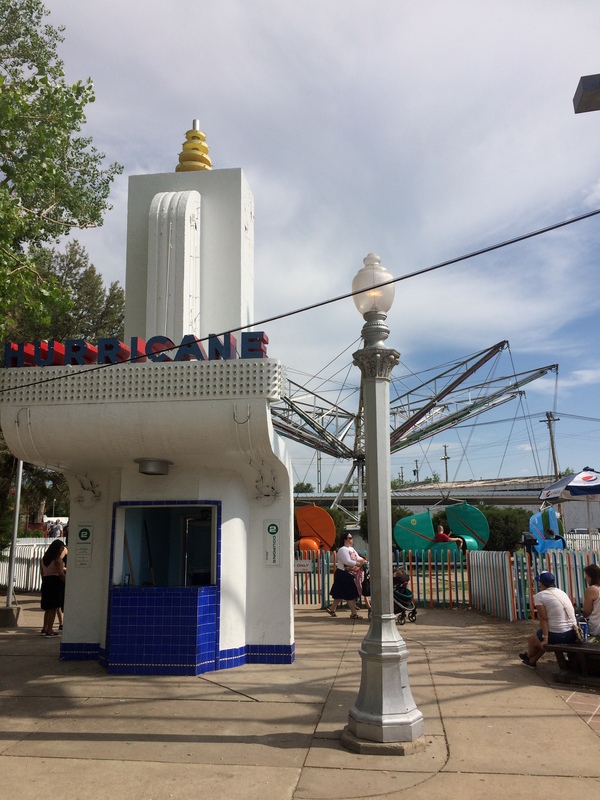 This attraction operated somewhat similarly to the Zephyr that operated at Disney’s California Adventure in Anaheim, California. Here is the on ride video from ThemeParkHD’s YouTube channel. 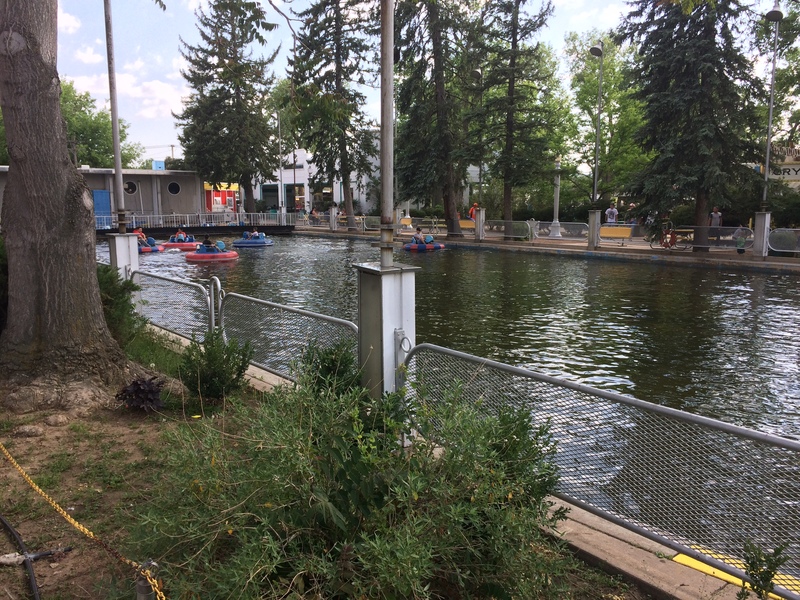 The last two are the Pony Track where kids could ride a guided pony around a track and the Speed Boats that took riders of a high speed tour of the lake. I couldn’t resist taking this beautiful scenic photo from the Speed Boats area. 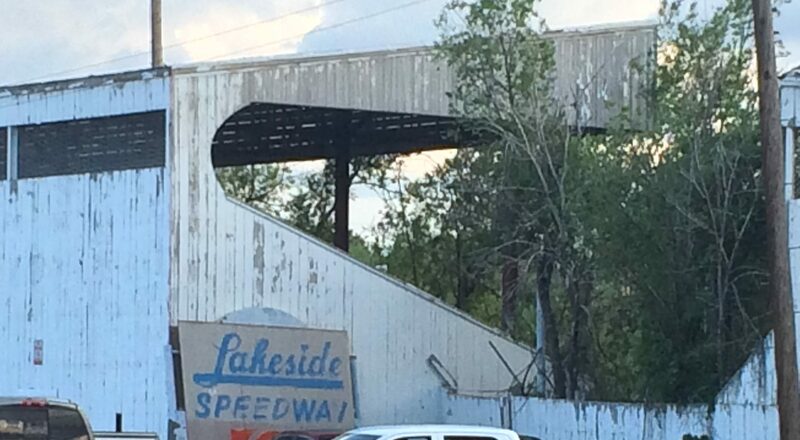 The park also ran their very popular dirt racetrack called Lakeside Speedway from 1938 until 1988 which hosted several Midget Car and Stock Car races. Thousands of people attended these races until the late 1980’s when it started to lose its popularity and became financially unfeasible to run those events. Here is an old 8mm home movie from paulwalters58 YouTube channel of what midget and stock car racing was like in the 1950’s. The park does have a very strict rule and doesn’t allow any professional type of photography or videography in their park so do as I did and stop by either the security or the main office and ask them about their policy. They DO NOT allow anyone to film their rides while riding the ride. 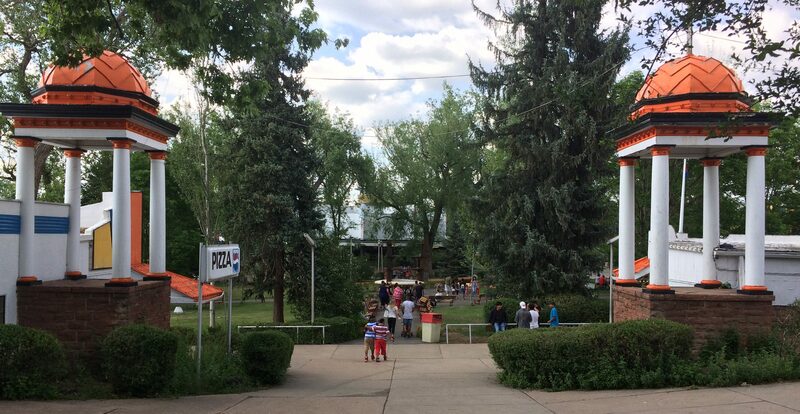 They do allow you to take a picnic lunch into their park as they have several picnic pavilions on the south side of the park as you can see in the photos below. 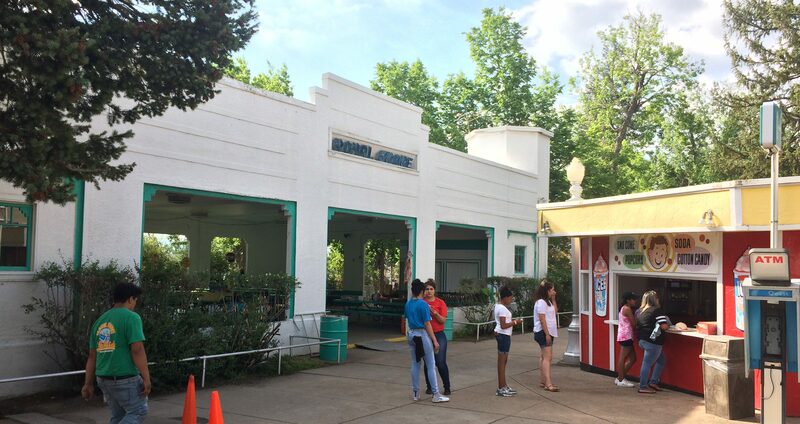 There are several snack stands and restrooms throughout the park but the do have a restaurant near the Merry Go Round which I believe is, or at one time was called the Gayway Inn. It has the marble back bar from the original Union Station that used to be in downtown Denver. This place serves the standard amusement park fare of burgers, chips, fries, soda, and bottled water but they do serve something extra called a Mexican Burger which is something I’ve never tried and it was pretty good. 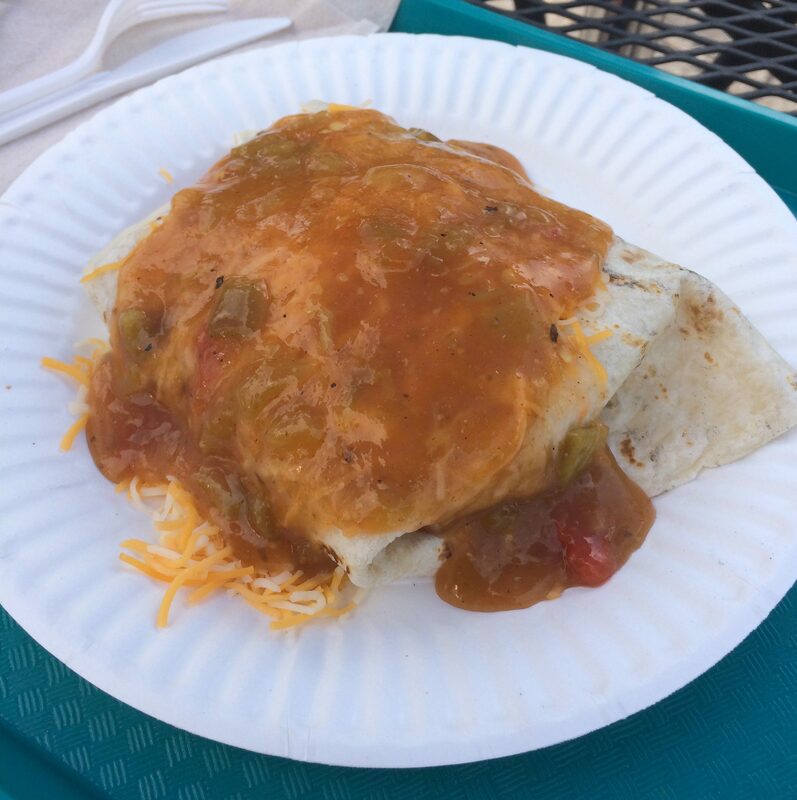 If I remember correctly, the Mexican Burger is a regular beef patty with refried beans that is wrapped in a tortilla and topped with shredded cheese and a spicy sauce. I recommend eating this at a table and using a knife and fork and have plenty of water on hand because you’ll need it. You have to pay $4 per person at the entrance to the parking lot and then you can either pay one price to buy a ride all day wristband which is the best value or you can buy individual ride tickets. Now that the essentials are done with, let’s get to the rides. 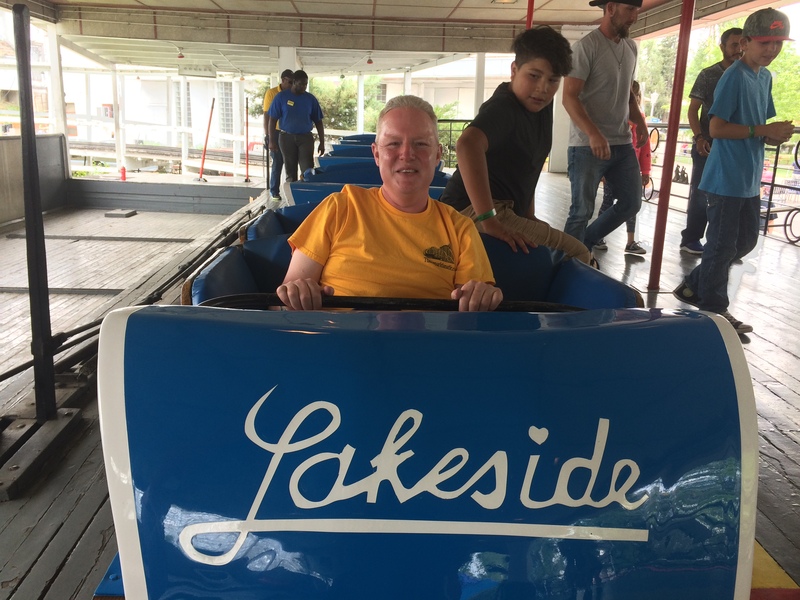 I’ll be working off of memory so I do apologize if some of the rides are out of order as the park doesn’t have a printed map for me to go off of so I will start on the southwestern edge and work my way around the lake. 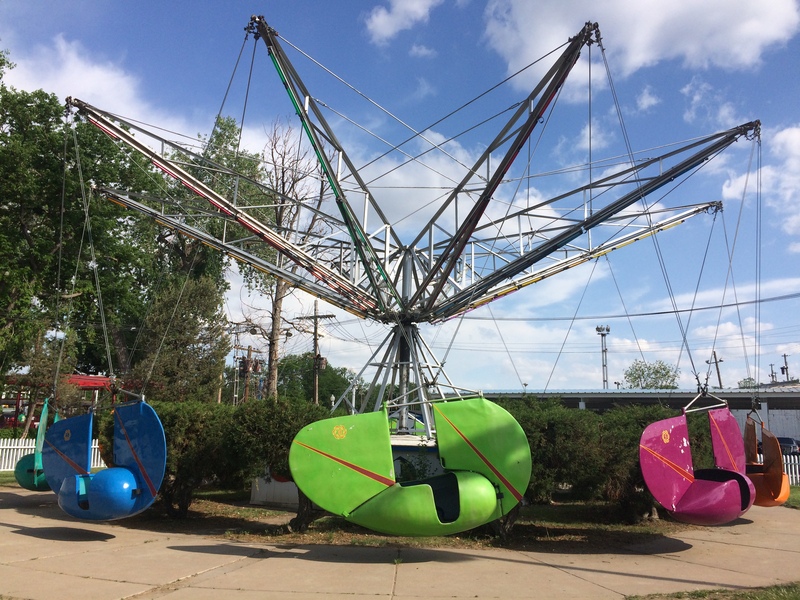 This ride is from Grover Watkins and is a ride where two people ride per gondola and you can spin each gondola by turning a disc in the center of each gondola. This is an Aristocrat Wheel from the Eli Bridge Company. This is a Flying Scooter attraction from the Bisch Rocco Company which is still manufacturing and refurbishing these type of attractions since they opened in the 1920’s. You can alter the height of your tub by moving the rudder to the left and right at the right time. Here is my off ride video of the Hurricane from my own YouTube channel. 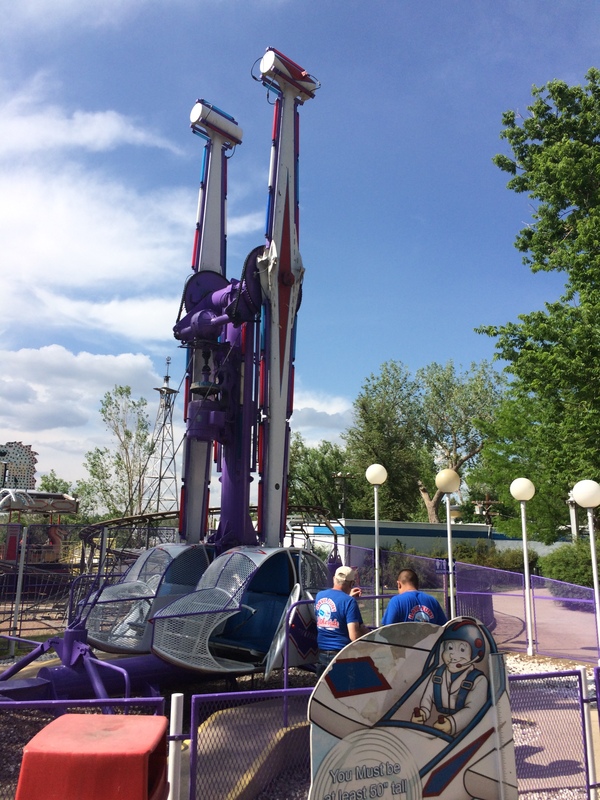 This is a Super Shot drop tower ride from A.R.M. It can carry 12 riders at a time and I’m guessing it is about 100 feet tall. This Round-Up model ride came from the Frank Hrubetz & Co, Inc. and was one of the first trailer mounted rides ever built. Up to thirty riders are secured up against the wall. 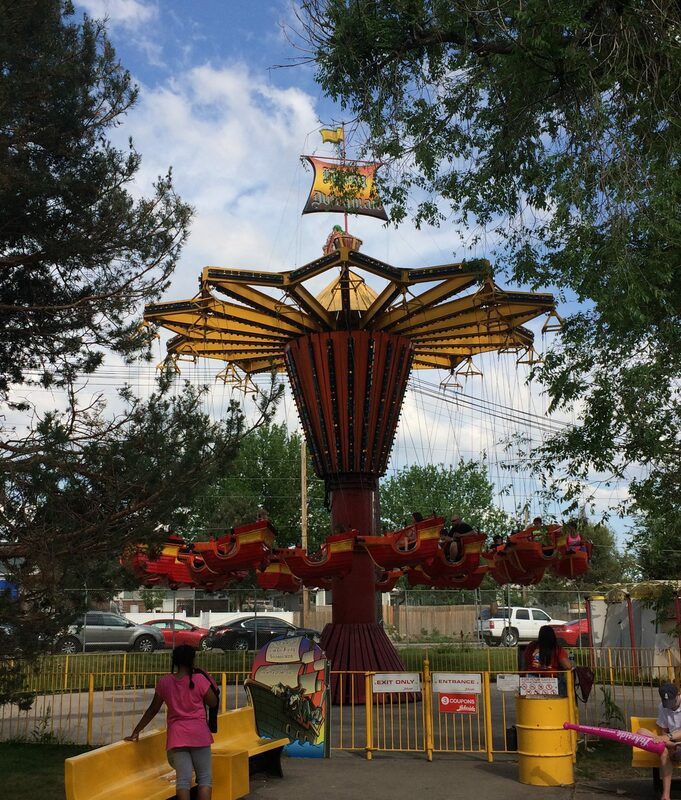 The ride then spins so that riders are pinned against the wall by centrifugal force and then the ride rises up to a 45 degree angle for a few minutes and then the ride descends and then comes to a slow stop. This particular ride is a classic and there are very few left in the US today. 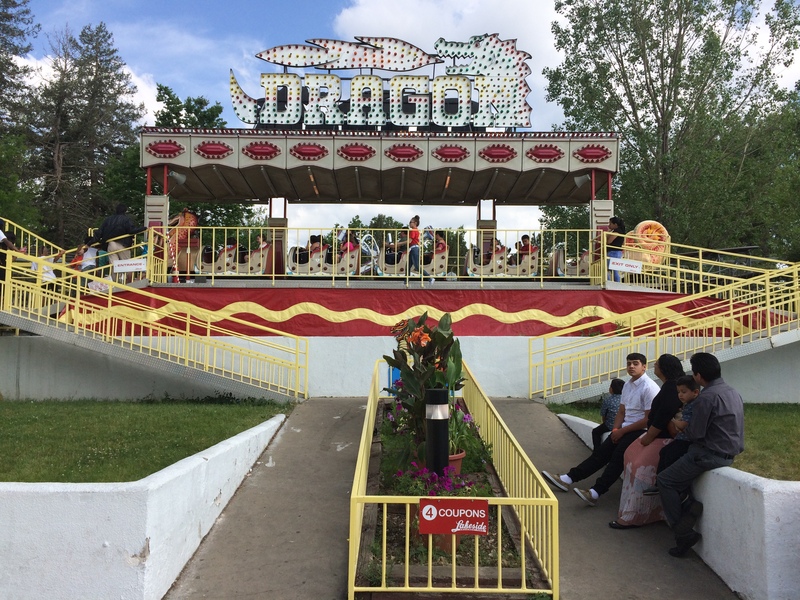 This ride was manufactured by the William F. Mangels Co. The ride basically whips people safely around each end of the ride in its oval course. It really is quite fun and worth the wait. This area has several rides geared for small kids only. There even is a small kiddy coaster here specifically for the little kids. 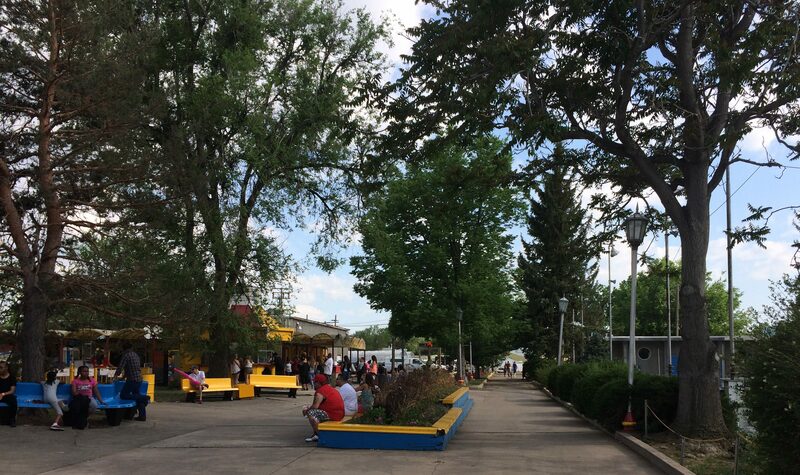 Now we’ll walk down this path to our next rides. This is a park model ride from Chance Rides (I believe) that carries 40 passengers per ride. The last two rides were on the right side, on the left is a boat ride in a pool as old as the park. 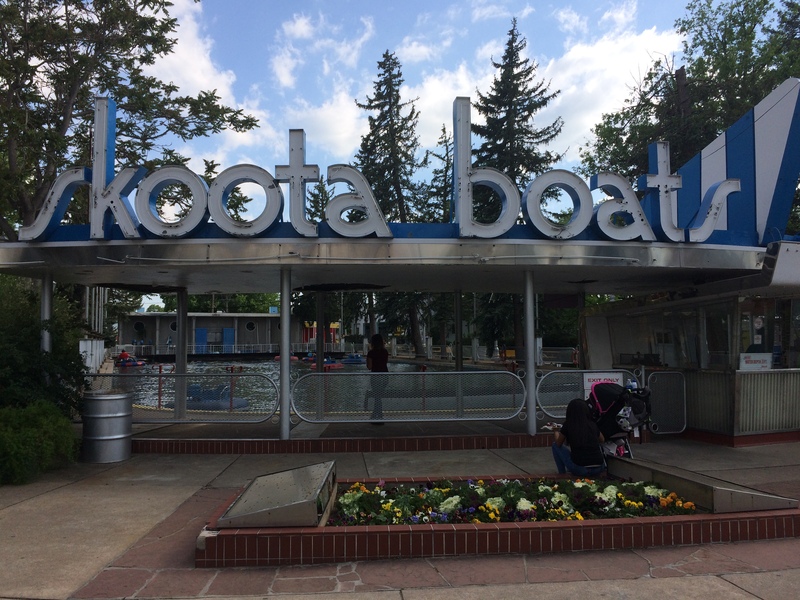 This is a bumper boats ride that utilizes the pool that was originally built for the Shoot-the-Chutes ride. Now we come to the gates where we enter the park entrance area but we’ll need to turn left to continue on with the rides. This used to be the parks shooting gallery which originally used real rifles. It now is just a hall of mirrors. 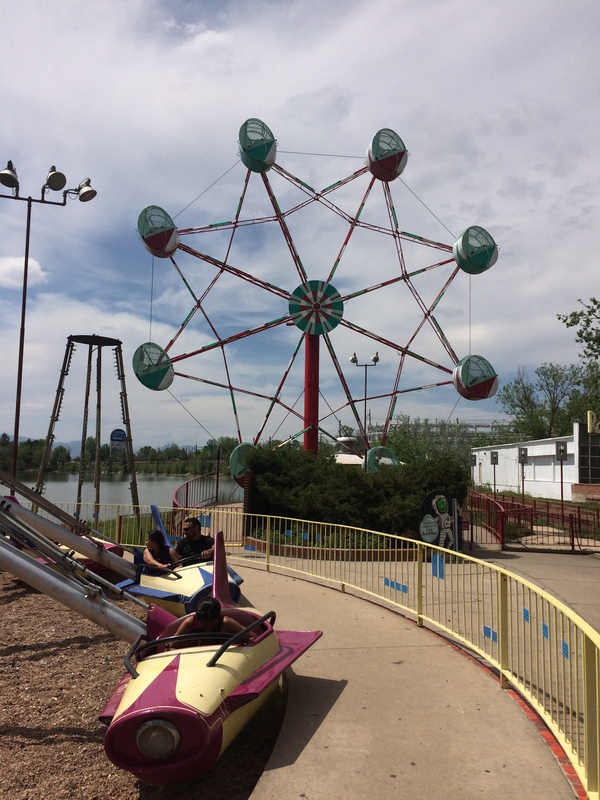 These type of rides were produced by the Eyerly Aircraft Corp and were very popular at most parks from the 1930’s up through the 1950’s. Here is my off ride video of this ride. This is a powered coaster from Zamperla that opened here in 1989. 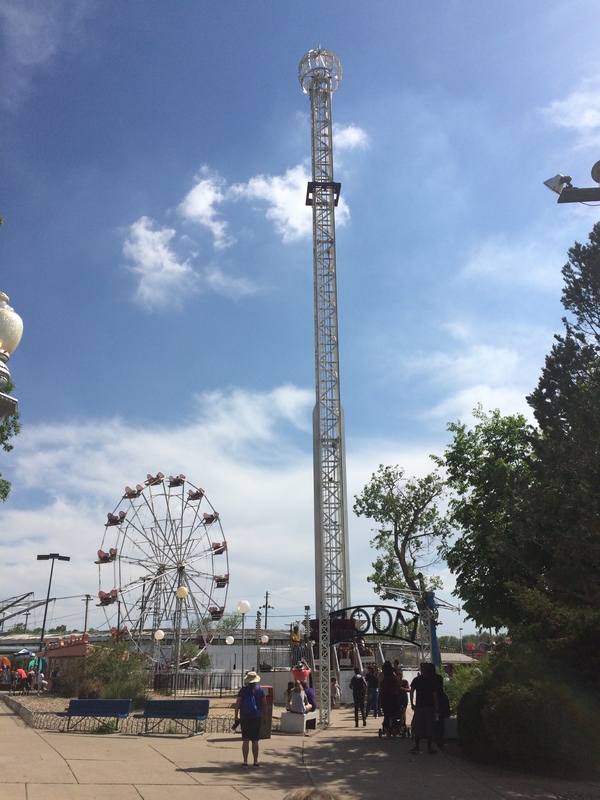 It is 280 ft. long and it took the place of the parks Fun House attraction. Next up is the parks bumper cars ride. Now we do an about face and walk along the lake. 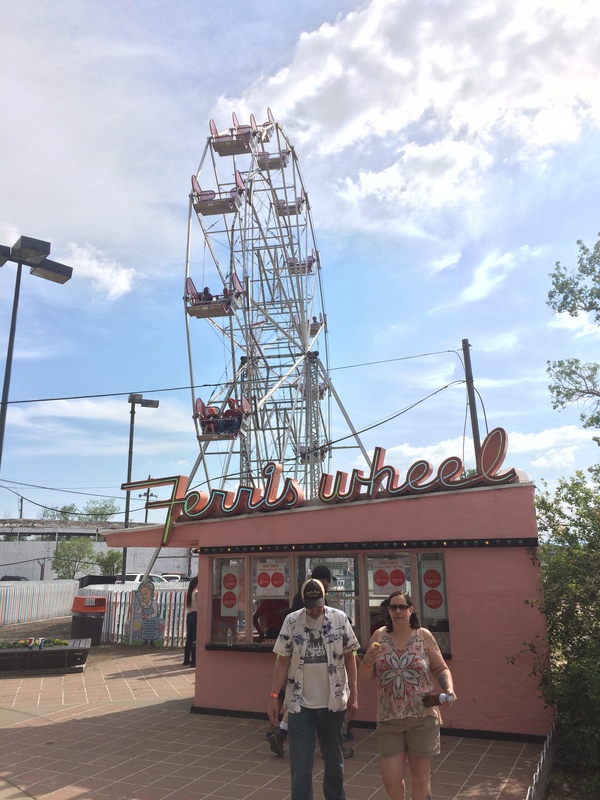 This attraction is actually older than the park is as it originally operated at the 1904 World’s Fair in St. Louis, Missouri. There are two engines, one called Whistling Tom, and the other is Puffing Billy. 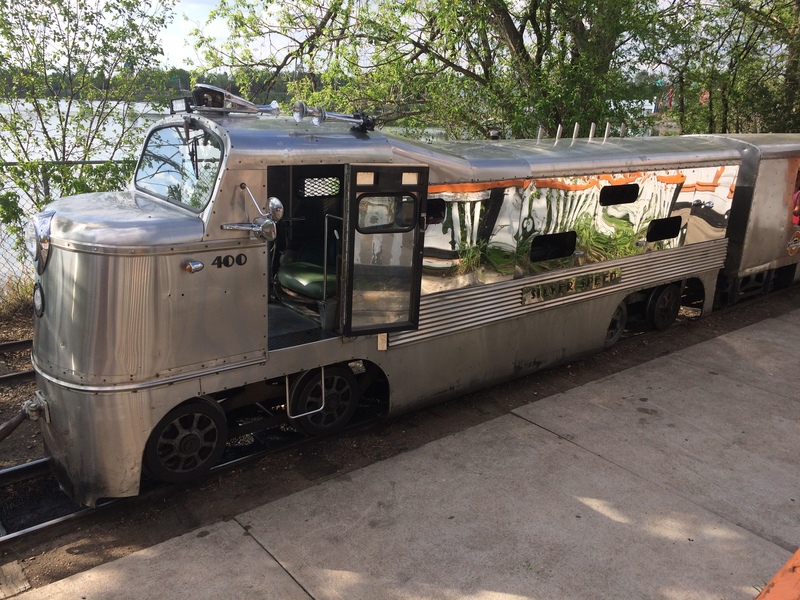 These trains were actually patterned after the California Zephyr. It was, and possibly still is, the worlds longest, rideable miniature railroad. 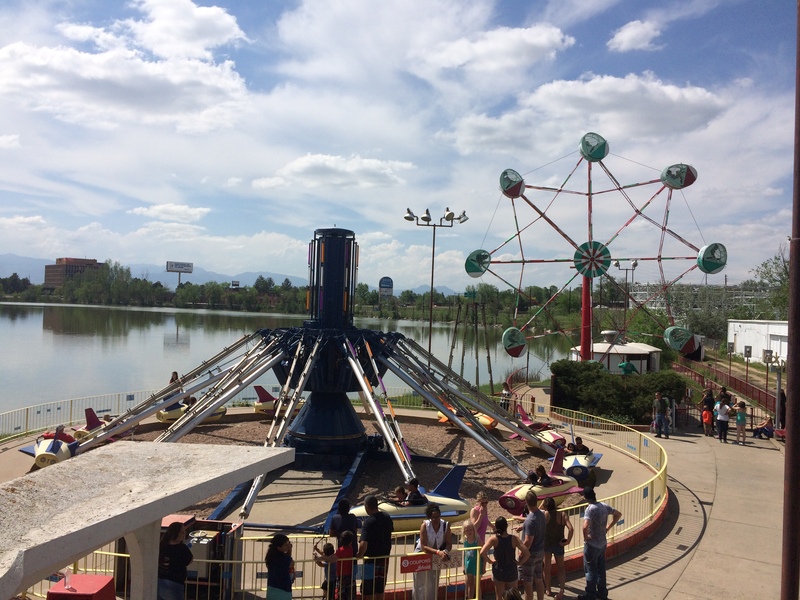 This ride offers some spectacular views of the park from across the lake. Here’s my on-ride video of the trip around Lake Rhoda. Next up is a true classic and a very unique ride to say the least. 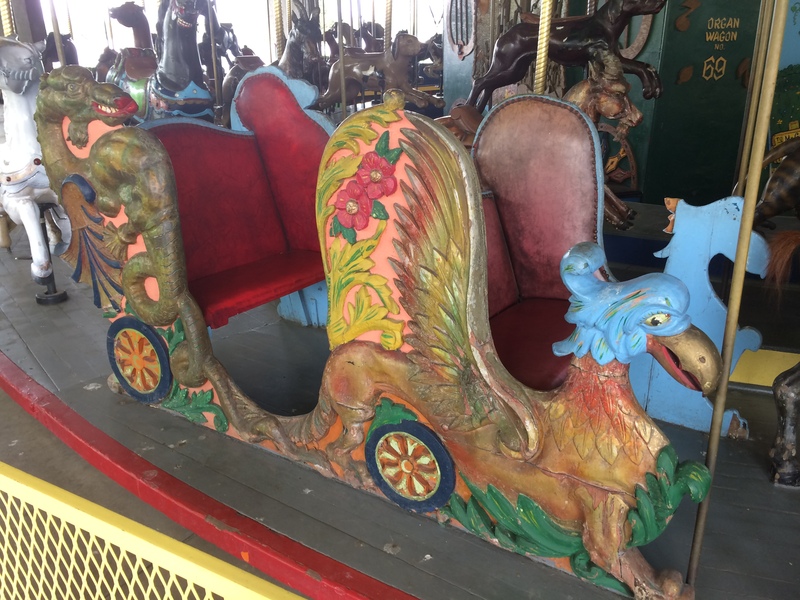 This carousel came from the C.W. Parker Co. and was built in 1908. 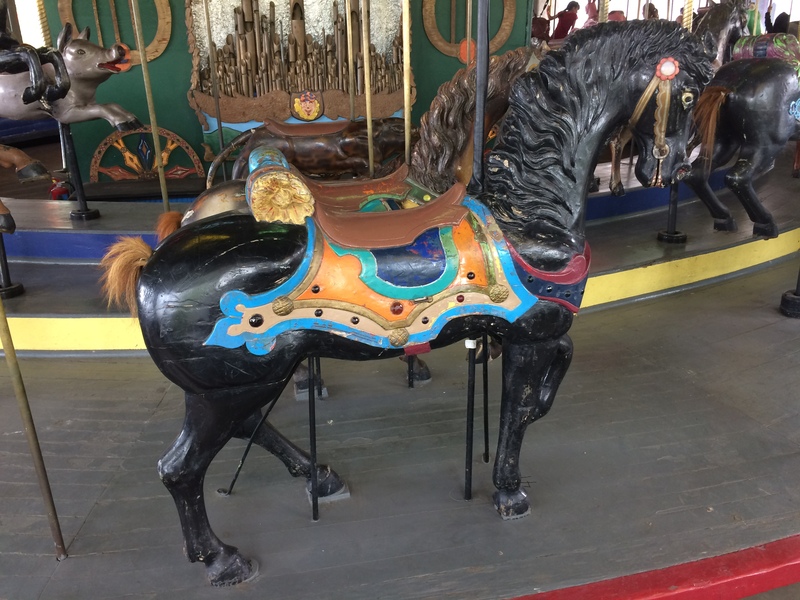 What makes it unique is that there are possibly several other animals carved by noted carousel builders like Charles Looff. This one also has a multi-level platform instead of the normal one level platform. 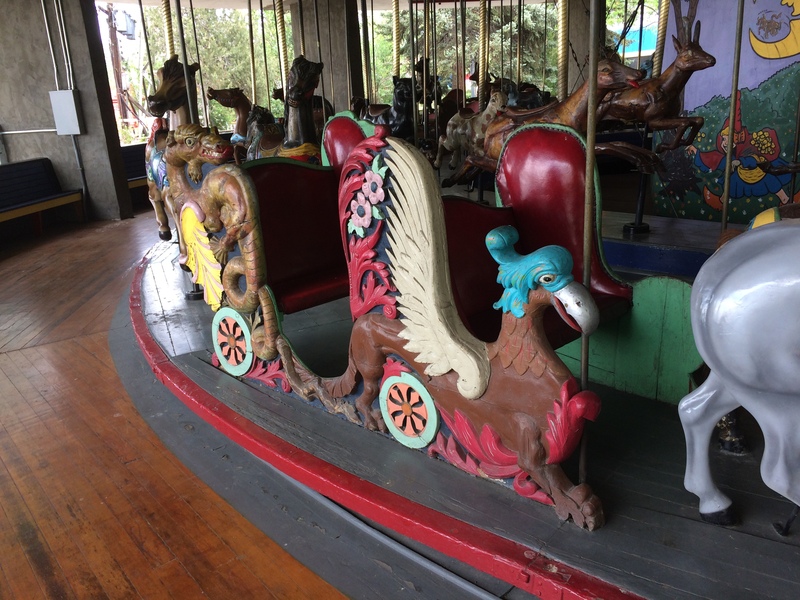 Also, most carousels have either inner or outer rows with standers, animals that don’t jump. This one has alternating standers and jumpers in every row. 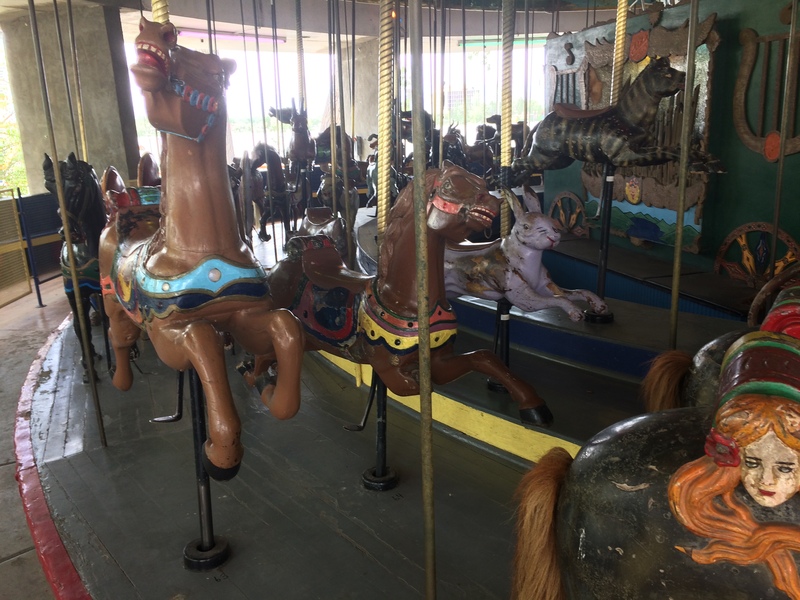 This carousel also has a menagerie that includes 16 jumping horses, 16 standing horses, and 40 menagerie animals (2 bears, 4 burros, 3 deer, 4 dogs, 2 tigers, 2 zebras, 2 panthers, 1 cheetah, 2 monkeys, and 3 cougars) there are also 4 chariots. All this information came from the National Carousel Association. Here is an interesting video I found on YouTube from WorthPoint. Here’s my off ride video of this beautiful carousel. Next up, we cross over the railroad tracks and venture out onto the island. No, it isn’t actually an island, but it is separated by the railroad tracks and so the long time employees call it “the island”. The first attraction is something that most other parks have as a up charge attraction. Here is my off ride video of this fun attraction. Next up is another classic. This one was built by the Eyerly Aircraft Company and is really quite fun if you can fit into it. The Rock-O-Plane is in the background of both photos. 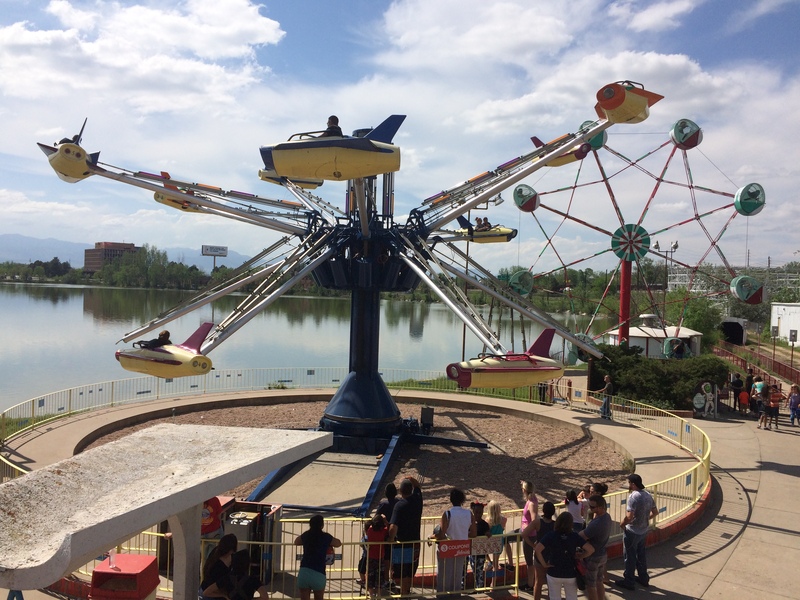 Riders board the ride by getting into one of the capsules and putting their hands on a lever. 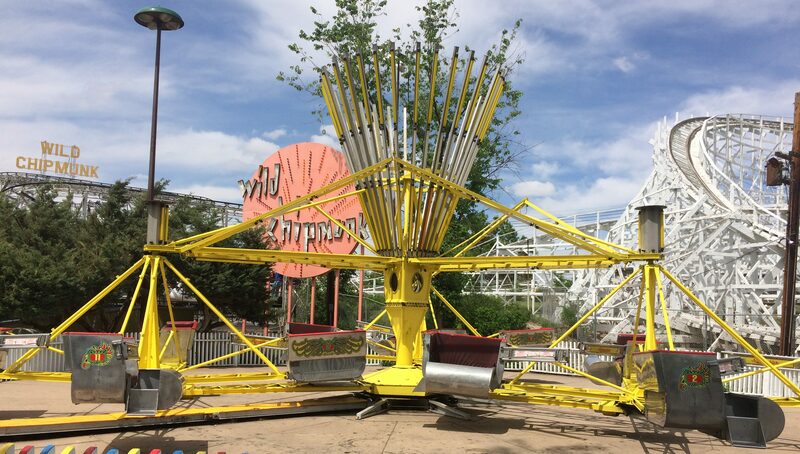 That lever is actually a brake that holds the capsule it its place as the ride rotates like a fast Ferris Wheel. You can rotate your capsule if you do it right. Now we come off “the island” and walk right to our next attraction. 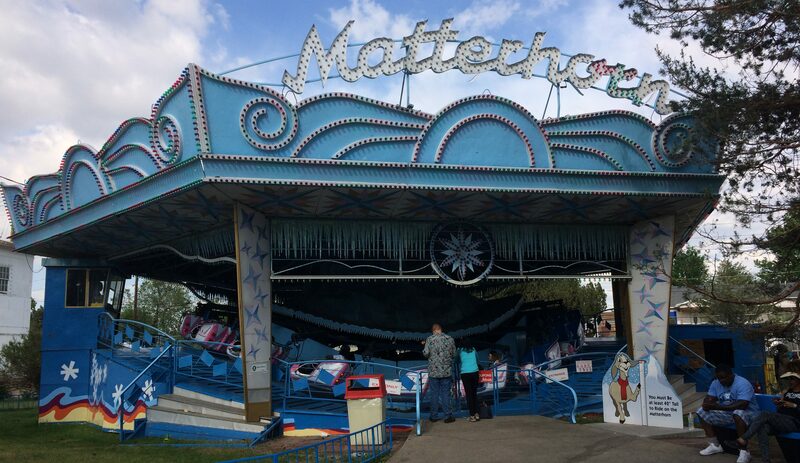 This coaster was built by Miller Mfg and opened here in 1955. It was named after the many wild Chipmunks that seem to inhabit the area parks. Benjamin Krasner chose this name as he noted how quickly the chipmunks can dart in and out of the bushes. 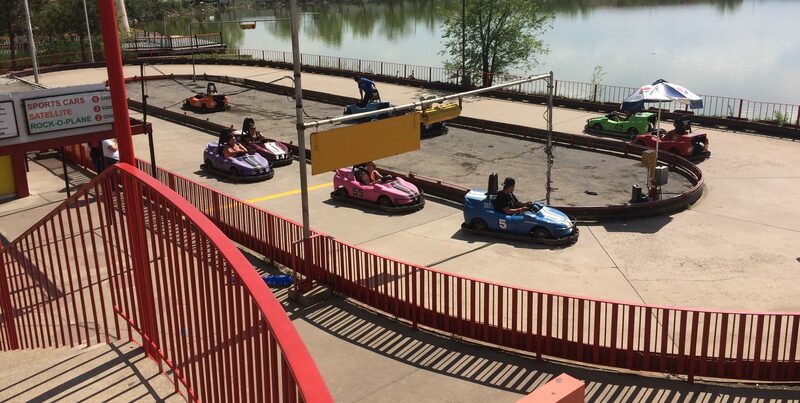 According to RCDB.com, this wild mouse type coaster is 1,150 ft. long, 41 ft. high, has a top speed of about 21 mph, and a total ride time of about 48 seconds. It is also the only wild mouse coaster I’ve ridden that is manually braked. 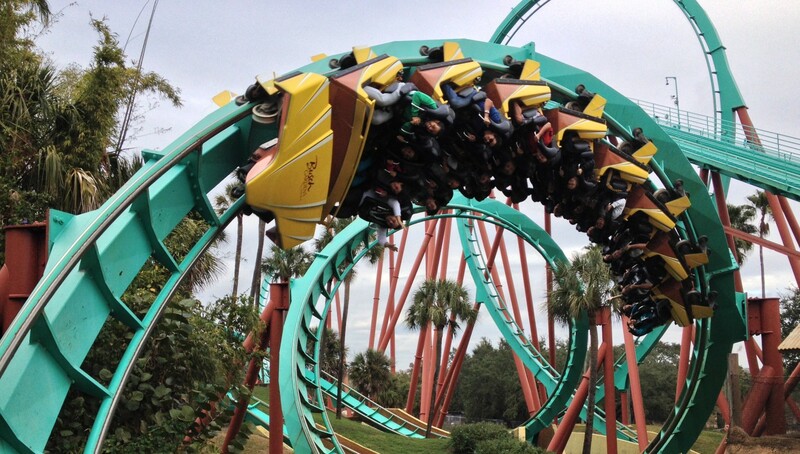 I recommend riders hold on and not ride with even one hand up in the air as there are no restraints. There’s a lot of padding but those turns and drops are sudden. Here’s my off ride video of the Wild Chipmunk. Next up is a classic ride that is still found at most amusement parks. 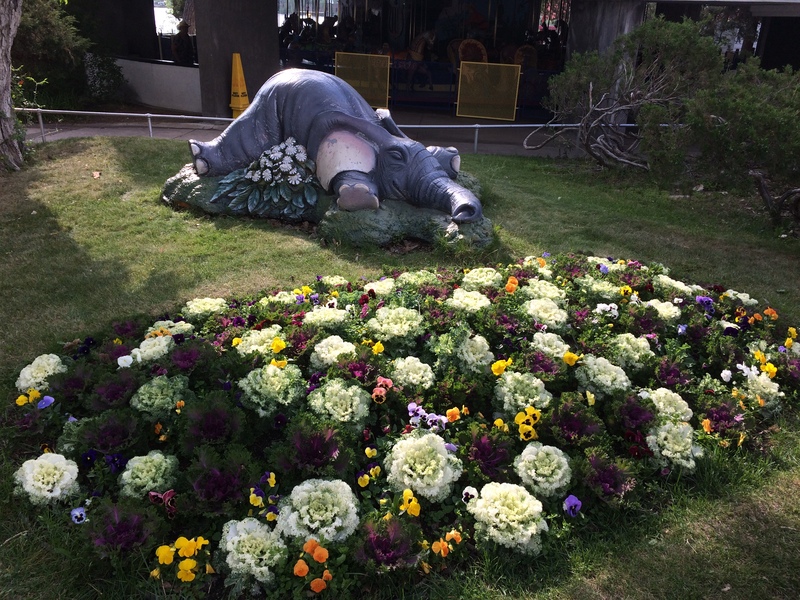 This attraction is from the Eli Bridge Co and is quite popular with families. This one is another classic and is actually still being built. The trick to knowing if it is one of the older or newer ones is to look at the cover of the individual gondolas. It is an older one if it comes with a cover like this one does. Also, to get a better spin, you need to lean into the turns as the gondola begins going down hill. The next ride is a true classic and a very special milestone coaster for me. 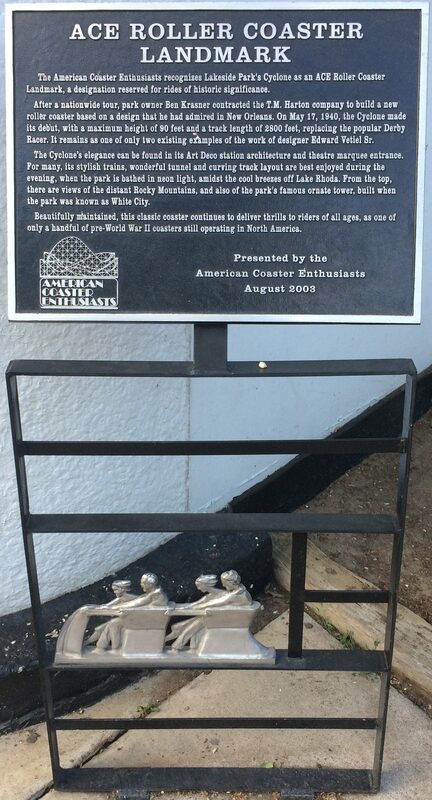 This coaster was designed by Edward A Vettel, built by the T.M. Harton Co. and opened here on May 17, 1940 and still uses its original manual braking which is amazing to see in person. This is only my third coaster that uses manual braking so it was interesting to watch, especially when the main brakeman applied too much braking and caused the train I was on to come to a stop on the brake run coming into the station. That was the first time I ever had to be pushed into the station by the brakemen team. 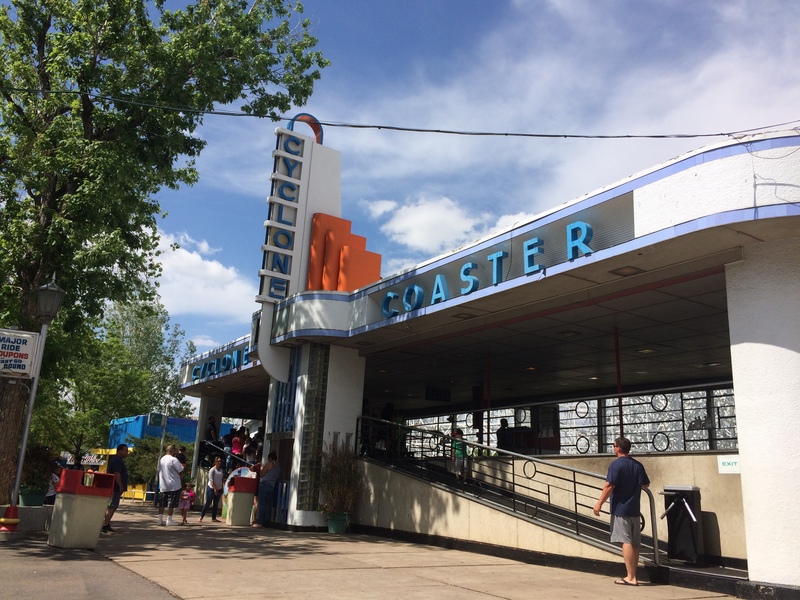 This coaster also has the distinction of being awarded the ACE Coaster Landmark designation by the American Coaster Enthusiast club (ACE). 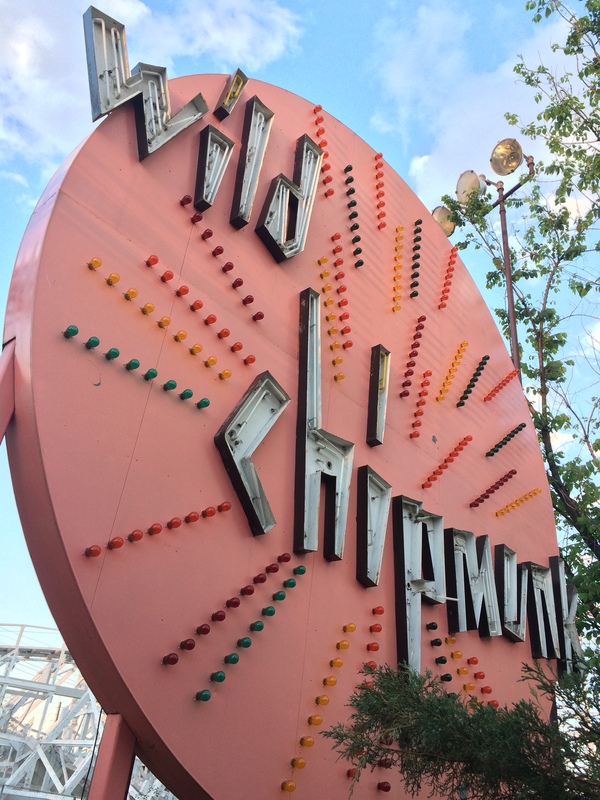 This coaster is such a classic ride in all respects from the coaster designs on the railing, to the neon that is all over the place, to the coaster trains that were built and beautifully maintained by the park. The photo above is a precursor to the computer monitoring system there were lights on the board that would light up when the coaster passed by that part of the track, letting the operators know where the coaster was on the course. 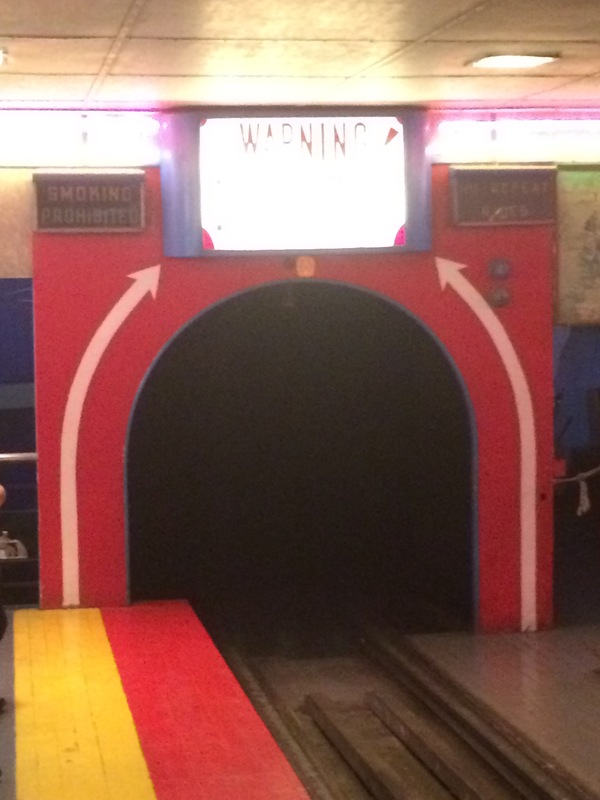 The train starts out by leaving the station and immediately going into a tunnel that contains a 190 degree turn to the right then a 190 degree turn to the left to left to get to the lift hill. 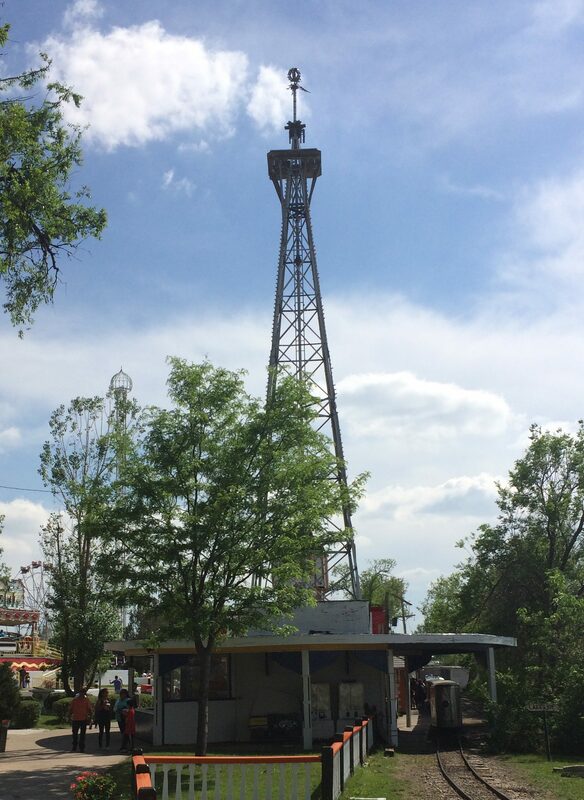 According to RCDB.com, this coaster is 2,800 ft. long, 80 ft. high, and has a ride time of about two minutes long. Earlier I said this was a special milestone coaster for me. Well, this was my 200th roller coaster I’ve ridden. My 100th coaster was Phantom’s Revenge at Kennywood Park near Pittsburg, Pennsylvania, my 150th was Intimidator at Carowinds near Charlotte, North Carolina, and this was number 200. Here is my off ride video of the Cyclone. Well, that brings us to the entrance of the park and the end of this tour. 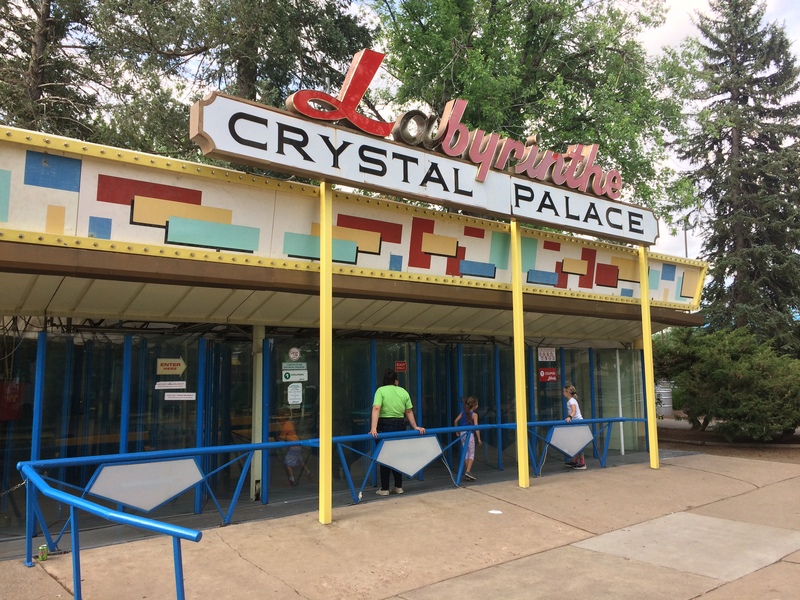 I really hope you enjoyed reading my review and would consider supporting this small, historic park in the future.